My chest feels heavy. My arms are cold, but it is not from the night breeze. My eyes fight unsuccessfully, sentiments I can’t accurately name yet. Dead people walk again, and they tell me stories –powerful stories. I know these stories, I have grown up with them; from books, from a teacher’s lips, and in my grandmother’s sighs. They are my stories, uneven blocks that have culminated into my present. Still, my chest feels heavy, my arms tremble, and my eyes will give in any moment now. Why? A woman stands on an outdoor stage with deliberately low lighting. She dorns a smock reserved for war, and she’s pointing a rifle around. Gloomy shadows stalk her, with the stealth of a hungry cobra. A solemn refrain hovers in the air above as her tale is being revealed by an omniscient narrator. As queen mother of Ejisu, she can no longer stomach the spinelessness from her elders in this critical moment when their freedom and dignity are being threatened. And so, taking matters into her own hands, she musters one last fight on behalf of her dear Asanteman. Her opposition is fierce, and the odds fail her. She is defeated and dispatched into exile on an island far away. Though a tragic end to a drawn-out battle, the essence of her gesture will be passed on for generations to come. One more: three World War II veterans are shot dead by one Major Imray on their way to present a petition to governor of the coast. This troubling re-enactment of February 28, 1948, fills the entire theatre with silence, and rapid, uneven palpitations. And then, there it is – I lift my finger, cautiously so as not to interfere with this meticulously curated atmosphere, and touch my face –the spot beneath my left eye. I run a finger along the moisture and rub it against my thumb. Our journey has been long, and occasional reminders of where it all started, and whose toil and pain have served as brick and mortar for the liberties and pride we bask in, even if unconsciously, are only logical. Because, at the end of the day, the more we know about our past stories, the better equipped we are with constructing new ones. The way these stories are re-enacted by the Wogbɛ Jɛkɛ team, how they establish the specific psychic temperature of a particular time in history… it affects you in a profound way. History, like Mathematics, is not necessarily the favourite subject of your regular Wofa Attah by the side of the road, or by Elsie Owusu with a backpack and neatly-polished black shoes over white socks. Because, History can be frustratingly nuanced and confusing. Unless you possess a knack for it, dates and strange names are discouraging right from the onset. Creators of this production have obviously gone through, and witnessed the challenges which come with trying to memorise history. Else, how would they have managed to create such a solid production? Unsurprisingly, many patrons, after seeing the play, recommend it for JSS students as it provides an easy way to relate with these accounts. A Chief Moomen original,Wogbɛ Jɛkɛ has become, perhaps, our most authentic capsule through the over 2000 years in which our stories are embedded. Details make a story, and the minutiae carved into the production are precise, down to the trivial quirks. The anthems, dressing, prevailing discourse, and other aspects of our culture at the time all corroborate the accounts our grandmothers divulged to us. That’s how we know a story is true. I shudder to attempt calculating how many hours, how much research has gone into the production, which has been running for two years now. Nobody told you, as an 80s born, when you heard the soundtrack to popular crime thriller Inspector Bediako, or lines from Ultimate Paradise, or Who Killed Nancy, or the iconic “Medofo Pa” Keysoap advert, to recite along with hearty nostalgia, or to sing the Nico and Sekina song, remembering exactly whom you stood next to by the small window as you watched it on a neighbor’s black and white TV. The Amphitheater of the University of Ghana was filled to capacity at the start of the show. Filled! And for many of the patrons (I’m certain), this was not their first time watching. 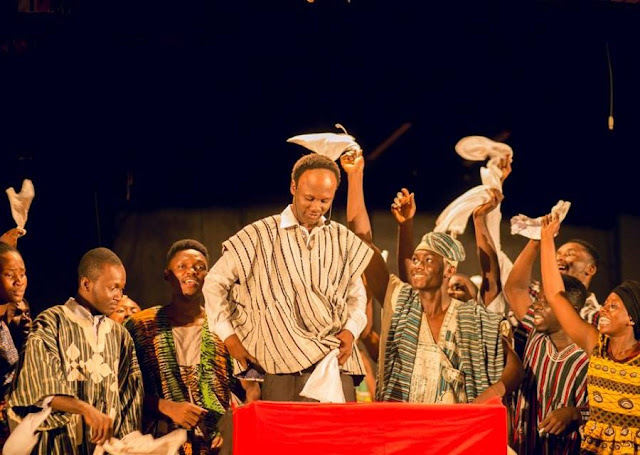 Since 2015 when it was first staged, Wogbɛ Jɛkɛ has been performed 18 times. So, what at all were they there to see again? Like wholesome wine, Wogbɛ Jɛkɛ has appreciates over the years, and is regularly retouched to harmonise with changing times, while still keeping the core themes intact. And so, though you’re watching something you’ve already seen, you’re also beholding something completely new. I don’t know how else to explain it. Just don’t miss it the next time it shows: a version detailing our musical transitions over the years (specifically highlife and hiplife) will be rendered at Citi FM’s Music of Ghanaian Origin (MOGO) concert later this month. Wogbɛ Jɛkɛ: Our Journey will also show at the at the National Theatre on April 15th and 16th. You’ve been informed! The packaging of Wogbɛ Jɛkɛ is exceptional, and is, perhaps, what sets it apart from any other attempt, and what has made it symbolic nationwide. It is a duteous mix of bountiful comedy, affecting poetry, enthralling drama, rich music and dance, and engaging narration from multiple voices. These are elements we enjoy everyday, and so Wogbɛ Jɛkɛ entrances us fast. The play is appreciated with a seriousness, and patronised by society’s crème and regular folk alike. Gathered with the rest of us like children by the fireside were such icons as comedy legend and broadcaster KSM, Gifty Anti and husband Nana Ansah Kwaw IV among others. Feedback on Wogbɛ Jɛkɛ usually goes like this: “this is a show worth seeing by every young person…even the older, because many Ghanaians don’t know the history of Ghana, and I think it’s good that he (Chief Moomen) has portrayed it in just two-and-half hours or so. He has done a marvellous work”, a satisfied Lawyer Sam Okujeto submits in an interview after one of the shows. Co-directed by Joyce Anima Misa Amoah and Abdul Karim Hakib, the production also receives support from experts with choreography, music, costuming, light design, sound, and audiovisuals. In all, the cast and crew for the production numbers a remarkable 170. So far, the Heritage Theatre Series runs three distinct plays: Birth of a Nation, A Tale of Two Men, and Rise of a Nation (first performed at the launch of the 40- year development plan in 2015). Entire productions have also been announced on sports, music, specific heroes, as well as various African stories at later dates. The play will also be performed across the country in coming months, and there’s an extensive world tour in the works. Conversations with creator Chief Moomen reveal to you two things: the current feats of Wogbɛ Jɛkɛ (too many to fit into a single essay) are merely a window to the bigger picture. Secondly, that he Abdul Moomen, the immensely talented poet and playwright, and contemporary custodian of our tales, is also demented for sure. You doubt me? Talk to the man about upcoming projects. Recited over instrumentals of singer Worlasi’s Possible, Chief’s final spoken word piece, which also ends the play, oozes with convictions of what tomorrow we can create if we finally cease with the blame games, let our yesterday teach us, and forge ahead as a determined people, harnessing our various abilities. At many points in the play, there are loud cries of “it is possible”. There’s something “higher” about the way the audience joins in the chants. It is the renewed dedication which follows an epiphany, or surviving an accident you should have perished in. We have been revived afresh. “I think the reason for all the divisions and the acrimony among the people is because we don’t know the history. If we know the history, we will appreciate that we’re different tribes who came together and lived together all these years, worked together, brought independence together, and helped build it to what it is now, but then, we can build much better, and we can do better by unity”. Again, not my words, but Uncle Sam’s. Wogbɛ Jɛkɛ is proudly sponsored by Keysoap. Media partners include ENEWSGH, Citi FM, among others. About writer: Entertainment writer from Accra. Editor, enewsgh.com. According to him, pounding music makes him dance -in his mind-.